Boy, that was cutting it close! We knew when we submitted the cookbook to the publisher a week later than we had planned that the book would be delivered a little later than we had wanted. We were still within their timelines for us getting the book in time for our diocese’s Parish Life Conference, but I was a little worried. The conference started on Wednesday, June 15. Guess when the books were delivered? Yep, Wednesday, June 15. We knew on the previous Friday that the books were finished. We didn’t know, however, if the shipment would get here in time. Monday morning we got a tracking number and found out the shipment was 1800 lbs! Tuesday morning the books arrived in Nashville — 20 miles away — but the tracking info still didn’t list an estimated delivery date. We called. “Did you need them anytime soon?” was the question that greeted me. “Uh, yeah. I really do need them soon.” Apparently FedEx Freight’s truck with a lift gate only comes to Murfreesboro from Nashville on Tuesdays and Fridays. The truck was already full for Tuesday. I pleaded our case and she said she’d see what she could do. Wednesday morning, I wasn’t sure if we’d get the shipment that day or not. One member of our cookbook committee, Mother Lara, headed out for Memphis. We had hoped she would be taking some cookbooks with her. About an hour after she left, the FedEx Freight truck pulled up to our delivery point with 47 boxes! Too late for Mother Lara’s trip, but they had arrived! On Thursday, Catherine & Angela headed to Memphis with several cases of cookbooks. The books were a big hit! By the end of the conference on Sunday, we had sold 47 books! A number of people were planning on getting the message out to their friends back home too. We also had the pleasure of giving copies of the cookbook to the conference’s special guests, Metropolitan Kallistos Ware and Bishop Antoun. It was great to spend time with friends, new and old. And I’m just so glad that the cookbook arrived in time to share it with them. Praise God! 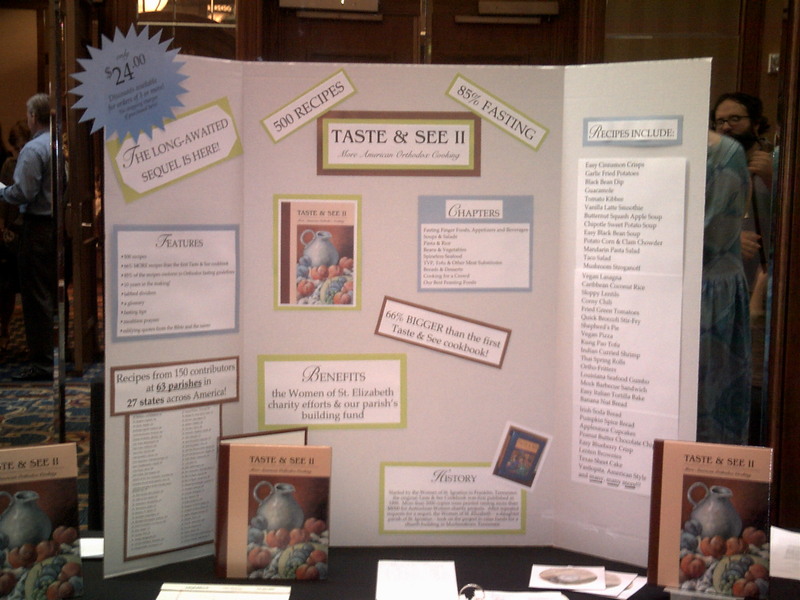 Taste & See II is available! The Taste & See Cookbooks have been created to help American cooks prepare meals that conform to standard Orthodox fasting guidelines while appealing to an American palate. Preparing meals during the fast should be as simple and stress-free as possible to allow ourselves more time for prayer, almsgiving and attending the services. 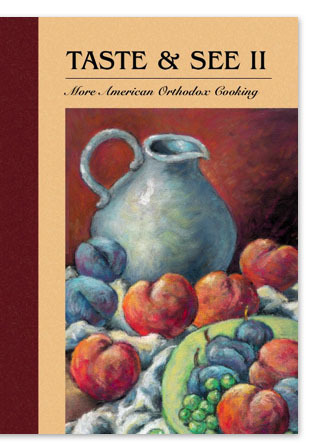 The newest cookbook, Taste & See II: More American Orthodox Cooking, has just been published. It contains 500 ALL-NEW recipes. The first 85% of the cookbook contains recipes that conform to standard Orthodox fasting guidelines. *Shipping is $4.50 for one book, $2 for each additional book. Proceeds benefit the Women of St. Elizabeth charity efforts and the St. Elizabeth Building Fund.